Cell phones are pretty much ubiquitous these days, and even those who aren't on them round the clock are at least carrying them. That's fertile ground for horror, and for Stephen King--who wrote the original novel from which "Cell" descends--the end result is a freaky slice of cell phone apocalypse. 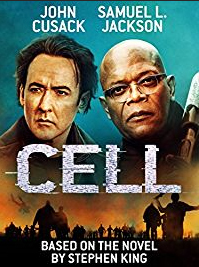 "Cell" follows a graphic novelist--comic book writer--who's just made a very big deal, at the cost of his family. When a bizarre cell phone related malady hits while he's temporarily in Boston between flights, the world starts to make a whole lot less sense. Gathering a few random souls together, our writer sets out in search of survival and what's left of his family. I enjoyed the book, originally, and seeing what the movie version did didn't really disappoint. Naturally, there's a lot of variance between the much larger King novel and this movie version, but it works out shockingly well. While this isn't John Cusack's first rodeo--remember how well he did in "1408"?--this may be Samuel L. Jackson's first outing, and he will do as fine a job as he ever does. Frankly, I always wanted to see Stephen King try a zombie apocalypse story on--well, aside from "Home Delivery", that short he did well before this--and this is probably going to be as close as I get. Still, it's smartly done, with some great action sequences, some unexpected situational rules, and all the dour thrills you normally get from staring the end of the world as you know it in the face, like sleeping in abandoned drive-in movie theaters. There are nods to mobile culture all over the place here, particularly in the text-message-speak painted on some of the signs (take a guess what "no-fo" means) as well as a very bizarre scene involving a ball field and the infamous Trololo song. It took almost 10 years for this movie to get from book to video release, and most will likely find the wait well worth it. The ending is a colossal downer. At first, it looks like a cheat, but then the full implications are realized, and suddenly all the joy goes out of it like the juice out of an orange when a flock of fruit bats lands on it. Special features include an audio commentary track, a making-of featurette, your choice of Spanish or English subtitles, and trailers for "Urge," "American Heist," "The Trust," "Criminal," and "Backtrack." All in all, it was a long wait to get from book to DVD, and the wait should prove worthwhile. The culture has only gotten more cell-f absorbed, if you can pardon the pun, and something like this is as darkly plausible as it is horrifying to consider.